I woke up on the early side this morning in hopes of getting to the coast for a few hours of birding. Glancing at my phone, the outside temperature read a frigid 18 degrees, which gave me more than a brief pause. I don't know how I got myself out of bed with that piece of information in mind, but I did. And I'm glad I did, because it turned out to be a beautiful day. Once the sun rose the temps climbed into the lower 40s. Combine that with almost zero wind until mid-afternoon, and I didn't have to wear all those layers I brought with me. On my way to the water I lucked into a flock of Canada Geese in Northford which held an adult GREATER WHITE-FRONTED GOOSE. I continued to the coast, where I started at South Cove in Old Saybrook in search of Bonaparte's Gulls. This used to be one of the two best spots in the state (along with the Oyster River mouth in Milford/West Haven) to view roosting flocks of Bonaparte's Gulls numbering in the hundreds to a few thousand. It hasn't been like that for years now, but I felt like checking anyway. We are in what should be the peak of the "Boney" migration locally, and a mid-morning low tide like today's was traditionally the best time to view the flocks. As expected, though, no birds today. I did a quick loop around Old Saybrook's hotspots, turning up two RED-NECKED GREBES and some PURPLE SANDPIPERS. I then poked into Hammonasset Beach State Park, where there were few birds to be found (and most of the productive parking lots still blocked from vehicular traffic for the "winter"). Nearby East Wharf in Madison held exactly what I was Jonesing for, flocks of plankton-feeding gulls and waterfowl. Some Bonaparte's Gulls were included. The action appeared to extend well down the coast to the west. 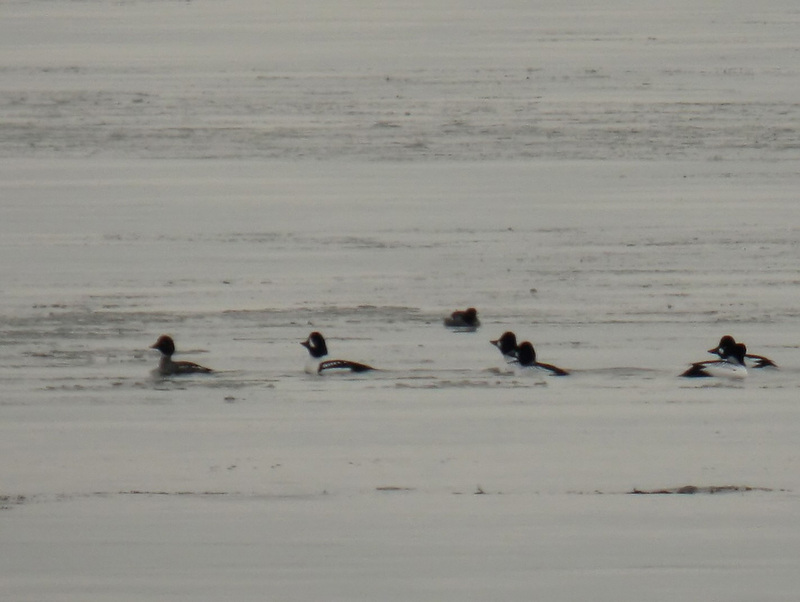 I did not leave without scanning the goldeneye flock in its usual location, where a drake BARROW'S GOLDENEYE was still present (found on March 1st). The feeding flock continued down the Madison coast and well into Guilford, finally ending near Sachem Head. Among the several thousand gulls and ducks were two adult "KUMLIEN'S" ICELAND GULLS and a first cycle LESSER BLACK-BACKED GULL. 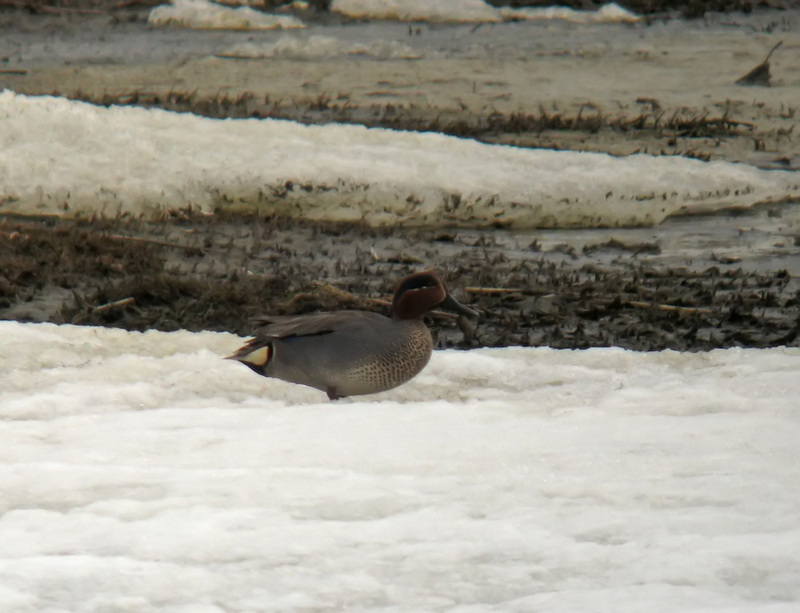 My final stop was at Shell Beach in Guilford, where a drake "COMMON/EURASIAN" GREEN-WINGED TEAL was present. Interestingly, the bird often covered its horizontal white stripe with the gray scapulars that lie above it, occasionally being almost entirely concealed. While this may not show in the photos, the bird was viewed very well through the scope and no signs of intergradation were visible. 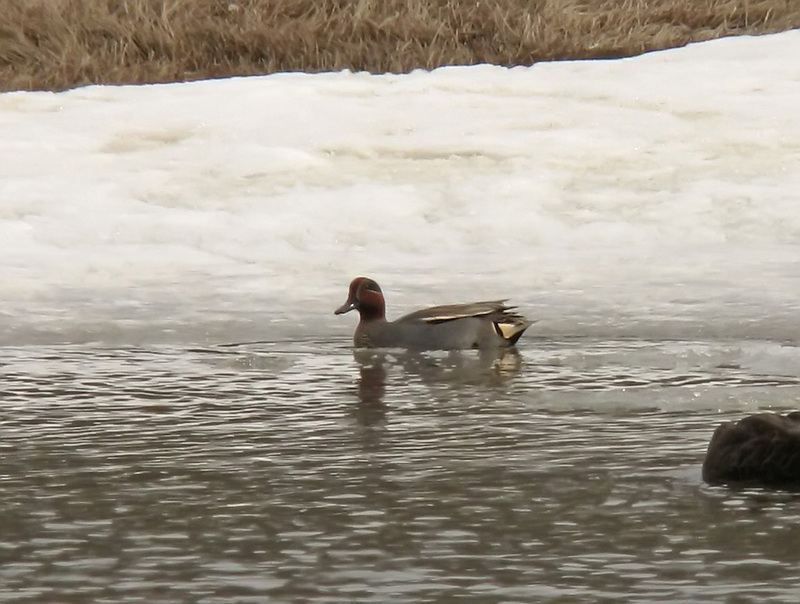 There was no hint of a vertical white breast stripe on either side, and the bird showed bolder white lines on its face, more coarsely vermiculated flanks (scope required), and a subtly more contrasting pale line between the gray flanks and black undertail coverts in direct comparison to nearby American Green-winged Teal.